Social defeat in mice is a potent stressor that promotes the development of depressive- and anxiety-like behaviours, as well as variations of neuroendocrine and brain neurotransmitter activity. Although environmental enrichment may protect against some of the adverse behavioural and biological effects of social defeat, it seems that, among male group-housed mice maintained in an enriched environment (EE), aggressive behaviours may be more readily instigated, thus promoting distress and exacerbating psychopathological features. Thus, although an EE can potentially have numerous beneficial effects, these may depend on the general conditions in which mice were raised. 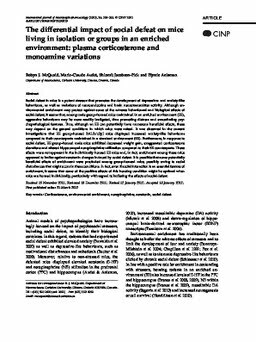 It was observed in the current investigations that EE group-housed BALB/cByJ mice displayed increased anxiety-like behaviours compared to their counterparts maintained in a standard environment (SE). Furthermore, in response to social defeat, EE group-housed male mice exhibited decreased weight gain, exaggerated corticosterone elevations and altered hippocampal norepinephrine utilization compared to their SE counterparts. These effects were not apparent in the individually housed EE mice and, in fact, enrichment among these mice appeared to buffer against serotonin changes induced by social defeat. It is possible that some potentially beneficial effects of enrichment were precluded among group-housed mice, possibly owing to social disturbances that might occur in these conditions. In fact, even if social interaction is an essential feature of enrichment, it seems that some of the positive effects of this housing condition might be optimal when mice are housed individually, particularly with regard to buffering the effects of social defeat.